We try to keep the collection updated with new literature as it becomes available. If there are books you would like to see in our collection, we gladly accept suggestions or donated books. Contact us with suggestions and concerns. 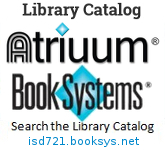 If you are looking for suggestions or "read-a-like", click here and then check to see if we have them in our library. Returning Books-Bookchutes are available for after-hours book return at New Prague Middle School. Borrowing and Renewing-All books are due two weeks after check out. You may renew a book as long as it is not on hold for another patron. Overdue books must be returned before checking out new books. Overdue Notifications-Patrons will be notified of an overdue item 1-10 days after the item was due. Final overdue notices are posted out 28 days after the item is due. This is an email or verbal reminder. The charge is the cost of the book if not returned. If the book is returned you will not be charged for the cost of the book. Reserve Notifications-When an item on reserve reaches the Middle School Media Center the item is sent to the Middle School Office. Please watch the TV announcements for reserve notifications.